ASP.NET Core 2 and Angular 5 – Video Course The 2018 best-selling bookin ASP.NET Core and Angular web development debuts into a video course on June 30, 2018! 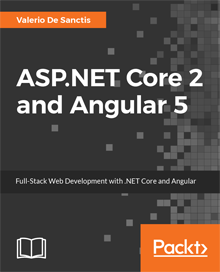 After many weeks of technical reviews, updates and revisions, the Video Course on the book ASP.NET Core 2 and Angular 5 is finally available on the Packt Publishing website! June 18, 2018 June 18, 2018 - by Ryan - 2 Comments. December 5, 2017 December 7, 2017 - by Dark - 2 Comments. November 20, 2017 November 20, 2017 - by Ryan - 2 Comments. November 7, 2017 November 7, 2017 - by Ryan - 10 Comments.